✿UPDATED NEW VERSION: Different from traditional lantern lamp, this 3-in-1 lamp lantern designs in 3 different modes. Stretch the lantern body, you can use it as camping light. Press the switch button you can use solar power lamp as flashlight. Even better, you can use it both modes at the same time. ✿ULTRA BRIGHT LED LAMP: Rechargeable battery and solar charger panel design allows you to use this emergency lantern in both indoors and outdoors. Features with high quality led design, our 3 in 1 led torch lantern is ultra bright and we also add a shade on the bulbs to protect your eyes. 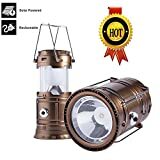 ✿HANDHELD SIZE FOR EASY PORTABLE: The extremely lightweight and 130mm*85mm hand handle size allows this led solar torch lantern easy to portable while you are camping, hiking, fishing, cycling, traveling and so on. It is great emergency lantern for hurricane and storm lamp. ✿NOVELTY COLLAPSIBLE DESIGN: Superior construction design makes this solar rechargeable lamp lightweight and allows this lantern torch light easy to expand and collapse. ✿USB EMERGENCY CHARGING: Designs with USB output, this rechargeable lantern can use as emergency power bank for Android Phones. (not suitable for IOS so far) Please don’t use it while charging. ★ Designs with solar panel and AC plug, can be recharged by AC power or solar. If you need the camping lamp lantern in hurry, you need to charge with AC power. The solar charger will take more times due to the size of the solar panel. ★Please put the solar panel in full light so that the batteries can be recharged. The indicator light will turn red when the batteries getting charge. ★ Rechargeable functional allows our Camping light not only suitable for indoors and outdoors, but also suitable for car emergency collection. ★ 800 mAh rechargeable battery and 6 individual low powered LED bulbs make this lantern torch super bright and can easy light up the whole room. ★ Made of high quality ABS plastic our rechargeable emergency solar power lamp are durable for use and extremely lightweight. 1. 1xTwo functions (lanterns and flashlight) Super Bright Collapsible LED Camping Lantern. 2. 1x DC charging cable. 1, The indicator light (red light at side) will turn red when the batteries getting charge. And it will stay red if there is enough light cast on the solar panel. 2, The USB output function only working for some digital products with USB connection, such as Android Phones, not suitable for IOS so far. 3, Please don’t overcharge this rechargeable camping lantern for a long time to avoid unexpected damage to the lantern. 4 to 6 hours is long enough for AC charging. Sidekick BBQ Grill Brush 30 centimetres with heavy duty bristles. Great for cleaning any BBQ.